The leading sales engagement tool. Reach more prospects. Personalize your sales communication. PersistIQ adds powerful sales engagement features to Copper. Level up Copper CRM with the most advanced sales engagement tool. Copper makes it easy for you to focus less on your CRM and more on actually selling. Add PersistIQ into the mix, and you get the most streamlined sales workflow possible. Send personalized emails and calls to your Copper leads. At scale. Share top-performing email templates and campaigns with your teammates. Prospect, engage, and close leads all from one system. No bouncing between apps. And, because PersistIQ has bi-directional sync with Copper your activities are automatically logged and your data is always up to date. No work required on your end. CRM and Sales Engagement are the two most important systems you need for effective sales. Copper gives you the robust CRM you need to manage your customers. 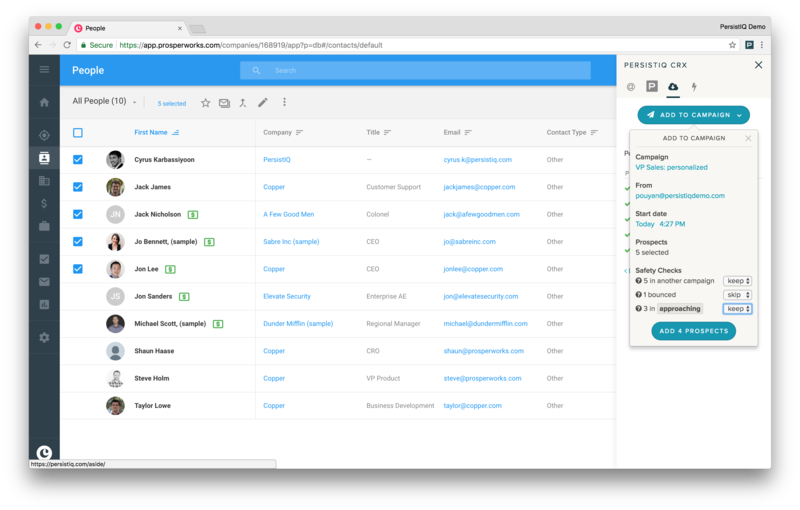 PersistIQ lets you prospect new leads and engage with them, right from Copper. So you get everything you need to prospect, engage, close, and manage your leads. Most sales engagement tools only work with Salesforce. PersistIQ is built specifically for Copper. This isn’t a patch; this is a level up. You already know the value of Copper. It uniquely integrates directly into G Suite. So you manage leads and close deals. All in one place. PersistIQ supports that same goal: Stay within G Suite. Reach more prospects with less effort. Stay organized at scale. Save 10+ hours every week. Improve sales collaboration with your team. Increase productivity and never miss a step with a prospect. Choose the Copper contacts you want to engage with. You can continue working inside the dashboard you’re already familiar with. Because PersistIQ fits seamlessly into your existing workflow. Add your contacts to PersistIQ campaigns. With one click. PersistIQ lets you engage with your contacts right from Copper. No need to jump from dashboard to dashboard. Send personalized communication so you close more deals. Sales engagement features have always been missing from Copper. No longer. From prospecting to closing, PersistIQ gets you more out of Copper. All activities in PersistIQ are updated in Copper. Contact status updates automatically based on email responses. Client information kept in sync across both platforms. Teams that integrate PersistIQ with Copper save an average of 10 hours per week. For years, you've had to use third-party syncing applications to connect your sales engagement tool to Copper. They’re slow and outdated. That time is over. PersistIQ is the only sales engagement tool that syncs seamlessly with your existing Copper data and workflow. Exactly as you like it. “PersistIQ is extremely intuitive, and the workflows are so smooth. It lends itself to really strong sales behavior."